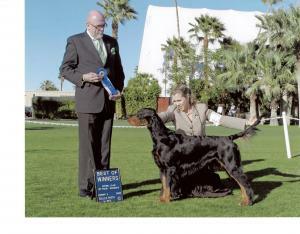 Murray finished his AKC championship in Phoenix February 27, 2009. Just for fun Cindy is having him moved up to Specials for the rest of the weekend. Congratulations Murray we are proud of you. Murray had a great weekend in Denver Co. February 2009. Taking BW all four days and adding a Best of Breed win over specials on one of them he now sits on 13 points with both majors. At this rate he will be finished before his parents. Murray is always beautifully presented by Jorge and Susie Olivera. 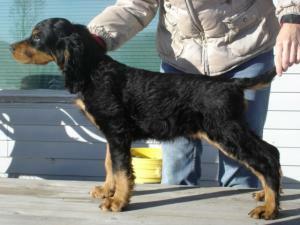 Now we are anxiously awaiting show pictures to put on his page. 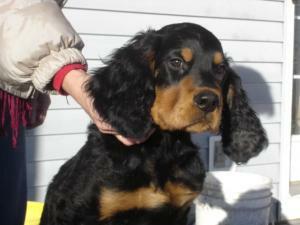 Sassenach Dunvegan Diamond - aka Neville.or should I say Murray which is what his new mom Cindy calls him. WE had fun visiting with Murray at the show in Palm Springs. 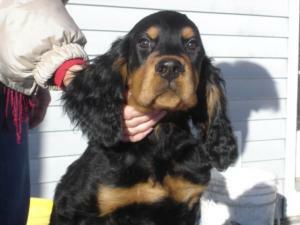 Murray is growing into a handsome young man. I hope to have new photo's soon to put on his page. Murray kept things in the family when he went reserve to Edward at the Specialty on the Friday and again Saturday. He proved on Sunday when Edward and Lillie were on their way home to Canada he can step up to the plate and fill their pawprints. Murray was awarded BW . Keep up the good work young man! He's growing into a beautiful young man. Expertly handled in the ring by Jorge Olivera Murray already has a 4 point major under his belt at 13 months. He loves his life in Scottsdale, especially the being spoiled part. Neville has decided that snow is nice on Christmas cards and the mountains. Neville has quickly made his mind up to live in a warmer climate and decided he is Arizona bound. Neville is looking forward to meeting his new mom and canine siblings, he knows he is going to be special as his mom is coming to collect his so he doesn't have to fly by himself. Neville has made the move to Scottsdale, Arizona, Cindy his mom reports that he had a good flight, but needed to play with his toothbrush before coming into land. Neville's first night was spent where he has always wanted to sleep - on the bed. 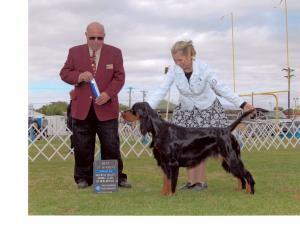 Neville's pedigree is quite international, combining Gordon setters from North America, Australia and United Kingdom. 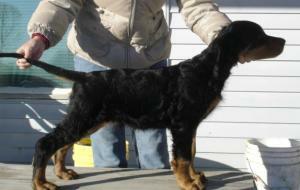 Pictures on this page are taken at 12 weeks of age.